Last October, I started working at a comic book store. As I've mentioned before here, I feel pretty lucky that I live in a city which has not one, not two, but three, comic book shops, so apart from benefiting as a consumer, when I saw a part-time position advertised at OK Comics, I applied- I didn't need another job, but I wanted to know more about the business side of comics and comics in general, and thought this would be a way to facilitate that. While I'm still not convinced of my ability (or inherent lack thereof) to sell anything, I love being around comics, and I love working with the guys (who put up with a lot from me, God bless). We were at work one morning, shooting the breeze, talking comics, talking this and that, and the name of the shop came up. 'OK Comics?' I said, 'Is that a dry, sort of ironic thing- they're not great they're not bad, but they're ok?' And then Jared proceeded to tell me a great story about the name's derivation, and how my blog had an inadvertent, serendipitous connection to the whole thing. It's a pretty cool story, an interesting, you-couldn't-make-it-up, slice of comics and popular culture, and I thought it'd make a nice bit of reading for a Friday, so here we go. In 1993, Coca Cola, still feeling the after-effects of recession, made the decision to re-hire Mexican advertising guru, Sergio Zyman, as head of marketing for all the company's beverage brands, giving him the task of creating a new drink that would help Coke capture the highly-sought after Generation X and Y demographics. Zyman's appointment was a surprising choice, mainly because he had been an integral player in the fiasco that was New Coke, a disastrous campaign that is still seen as the largest failure in Coke's advertising history, and one that almost bought the company to its knees (you can read about it here). 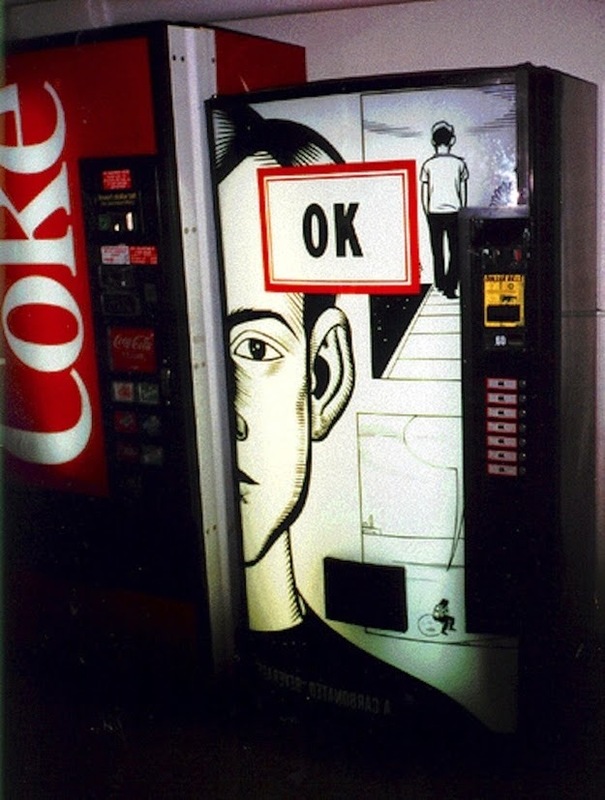 Nevertheless, Zyman decided the way to harness the attention and interest of these young misanthropes would be via something different- non--traditional, and so OK Soda was born -the name chosen after market research revealed Coke to be the second most recognisable word in the world, with first place going to 'ok'. 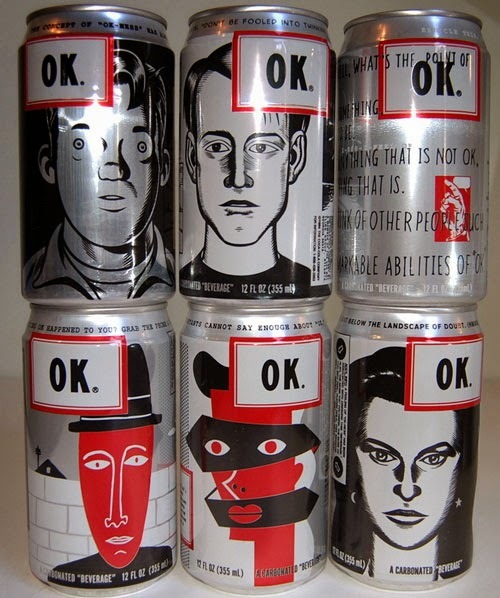 In order to provide OK Soda with a distinctive look, Zyman bought on board Portland-based advertising firm Wieden+Kennedy (the people responsible for Nike's 'Just Do It' campaign), who turned to the world of alternative comics for inspiration, hiring some dudes called Charles Burns and Daniel Clowes to help create and design the look of the brand. What resulted was a dull silver grey and black aesthetic highlighted by the occasional burst of red- 6 can designs were produced, each one featuring the head-shot of a different figure, some more abstract than others, all rather grim-looking, staring directly out at the consumer. The 'OK' was placed in a stark white box outlined in a red border, the unremarkable black font again emphasising the concept of, well, 'ok,' and oddly placed at the top left or right of the can. What’s the point of OK? Well, what’s the point of anything? 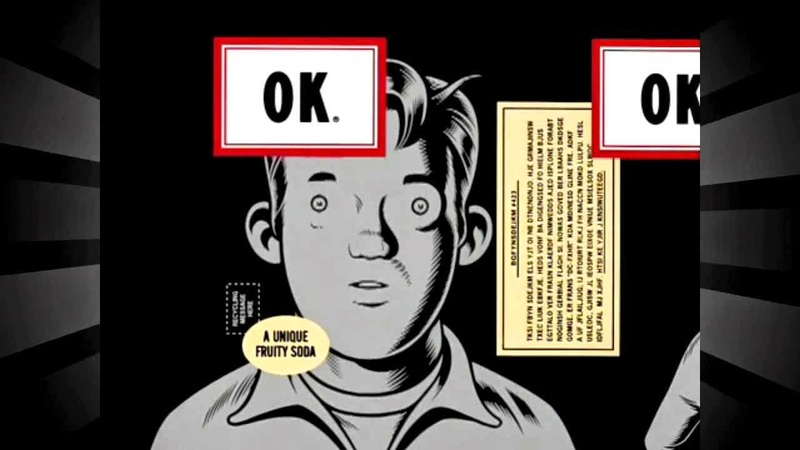 OK Soda emphatically rejects anything that is not OK, and fully supports anything that is. The better you understand something, the more OK it turns out to be. OK Soda reveals the surprising truth about people and situations. 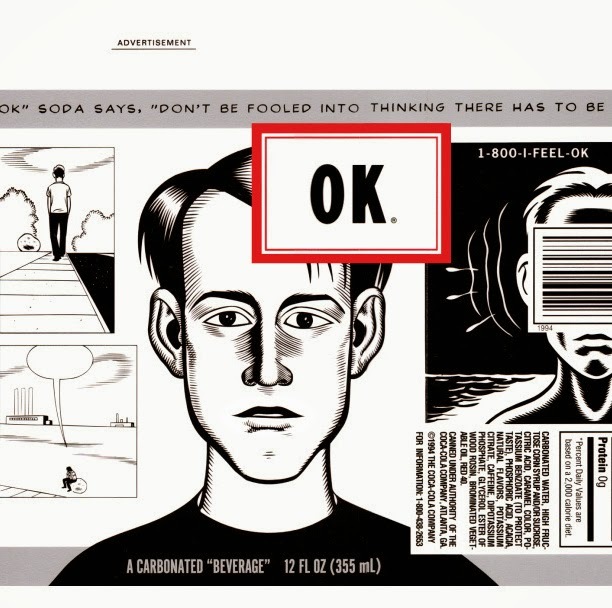 OK Soda does not subscribe to any religion, or endorse any political party, or do anything other than feel OK.
OK Soda may be the preferred drink of other people such as yourself. Never overestimate the remarkable abilities of “OK” brand soda. Please wake up every morning knowing that things are going to be OK.
Excerpts from the manifesto could be found replicated on the outside and inside of drink cans. Unsurprisingly, the drink didn't do well; the beverage itself, essentially Coke with a more citrusy taste, received a luke-warm response, and the campaign a corresponding combination of confused and are-you-for-real reaction, which led to it being pulled from shelves in 1995. In retrospect, it sounds horribly cringe-worthy, an overt, overly affected, too-cool-for school attempt to get down with the kids, a fundamental lack of understanding your audience, coupled with a muddled and heavy marketing approach. The idea of under-selling something to a segment of audience who doesn't care or buy into advertising shilling huge, empty promises seems paradoxical, to say the least, but I can't help but think it has an element of crazy genius in there somewhere, and that it could have worked (Clowes and Burn's graphics are nicely distinct and striking, and the red and black and 'ok' feeds back into the Coke brand) had they kept it more focused and streamlined, and not overcooked it with things like the OK Manifesto. As these things seem to go- and certainly this seems to be a story perhaps more deserving of that status than others- OK Soda now has a cult reputation and following with cans, promotional material, posters, and even the 5/6 vending machines that were produced featuring the Clowes/Burns art selling on Ebay for big prices. And that, my friends, is the unlikely connection between one of the largest brands in the world and two of our finest comic creators. And the story of how OK Comics got a name. Which brings us full circle back to... Comics and Cola!